We foodists are always looking for new ways to celebrate food and food culture. We’ve been kicking around the idea of doing a food-focussed film festival and, lo-and-behold, some very talented Vancouver Chefs are doing something very cool in that area. Read on for the details of Film Feast, a pop-up movie-house restaurant featuring the amazing film Tampopo. Film Feast is a peculiar pop-up that pairs an appetite-inducing movie with impassioned food. Winner Winner takes inspiration from Tampopo, a film about the quest for the perfect bowl of ramen, to serve their delicious duck ramen dinner. Presented by Yash and Winner Winner, this intimate and entertaining pop-up event is guaranteed to produce plenty of laughs and foodgasms, just be careful when slurping the broth. Winner Winner consists of three seasoned restaurant industry professionals; Chen-Wei Lee (Wildebeest, Blacktail Florist), Stanley Yung (Dirty Apron) and Alain Chow (Bao Bei). They made their debut together this past summer at the Vancouver Chinatown Night Market, dishing out an unforgettably fine-tuned Singaporean chicken rice. Growing up, Winner Winner favoured playing duck hunt to reading the tale of the three little pigs. Their ramen pays respect to the duck by resting it over a bed of hand-rolled noodles nestled in rich broth. Don’t miss out – this one-night-only pop-up dinner will fly away. In the age of instant information, we recommend leaving room for anticipation by not watching the trailer. If you absolutely must, then you can watch it here. Buy your tickets on Eventbrite. 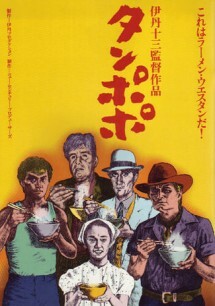 This will be a particular treat for you if you haven’t seen Tampopo. Enjoy!